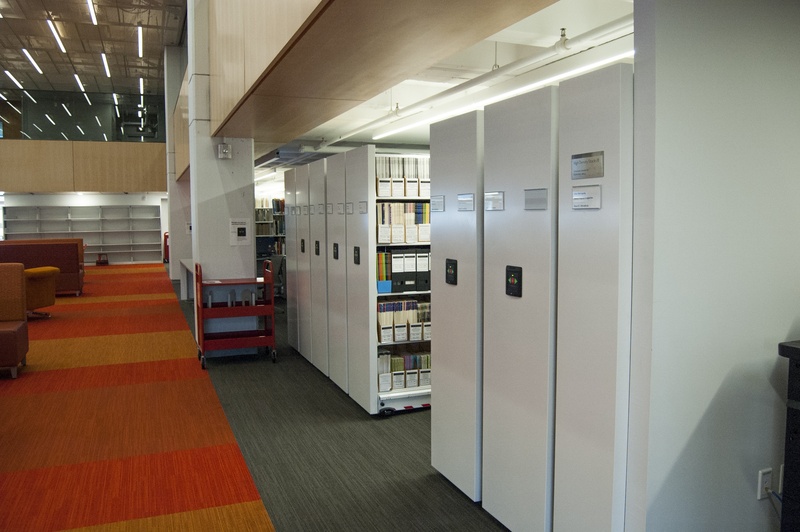 Wentworth Institute of Technology: Douglas D. Schumann Library and Learning Commons | Donnegan Systems Inc.
Wentworth Institute of Technology has always been a leading technical design and engineering university in the heart of Boston, Massachusetts. They were founded in 1904 and have been producing innovators ever since. Their interdisciplinary curriculum combines rigorous studies with practical learning experiences and they needed a better facility to support that. When the Wentworth Institute of Technology kicked off its library renovation project in August of 2015 their goal was to transform a very traditional library into a dynamic and technologically rich learning space which would allow students to learn in their own way. 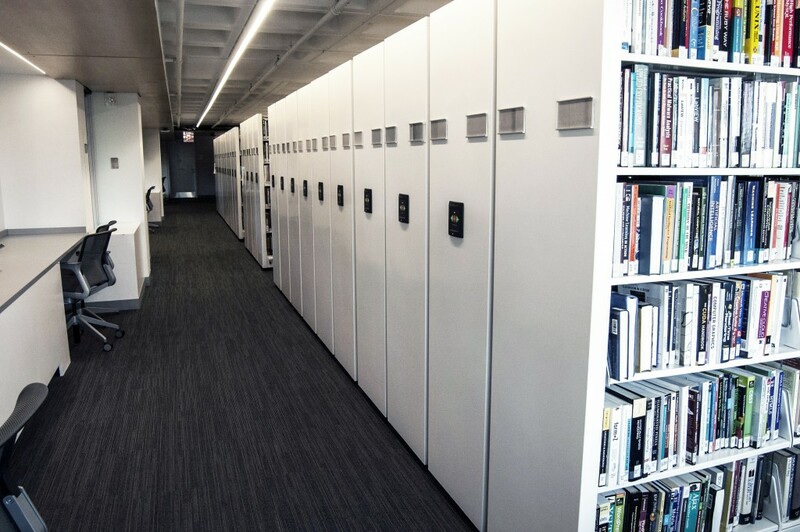 In order to give their existing library a new identity (or interior) they needed to bring more light into the building, open up collection spaces to be used for student areas, and completely retrofit their existing storage and shelving. Through designing shelving and storage solutions that would play into the open and bright interior of the new library and help save space to open up more room for study areas and Makerspaces, we were able to help achieve these goals. 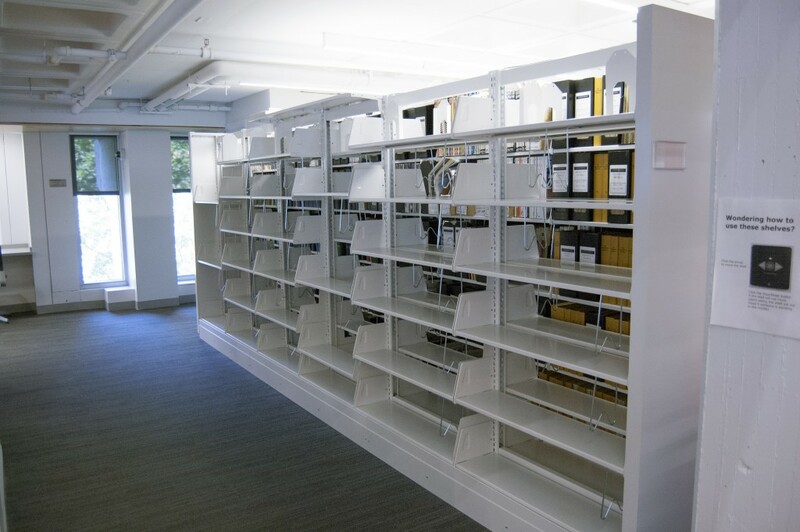 We implemented two High Density Mobile Shelving systems which now house 75% of the library’s collection, supplemented some static Cantilever Shelving, and incorporated magazine and article storage for a clean display of all collections. One of the main goals of the Douglas D. Schumann Library & Learning Commons renovation was to open up more space for students to collaborate. 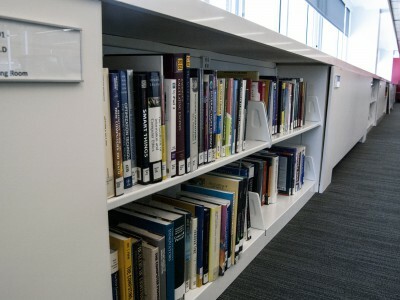 Through using High-Density Shelving Wentworth was able to consolidate their collections and open up more space for students. Many Colleges and Universities struggle to find space within their libraries because campuses are typically landlocked and buildings often do not have enough space to accommodate additions. One reason we believe retrofits and repurposing projects are preferable for Colleges and Universities over new construction is that it saves money in construction, and there are so many ways to use existing, underutilized space. One of the challenges in this project was working around the columns while still maximizing the space around it. We were able to make this High Density Mobile System work around these structural features in order to provide them with maximum collections storage capacity. Custom shelving along these windows allows for additional book storage in places you might not have seen as storage space before. Using half stacks of shelves can help let more light into the room and create a pleasing aesthetic. 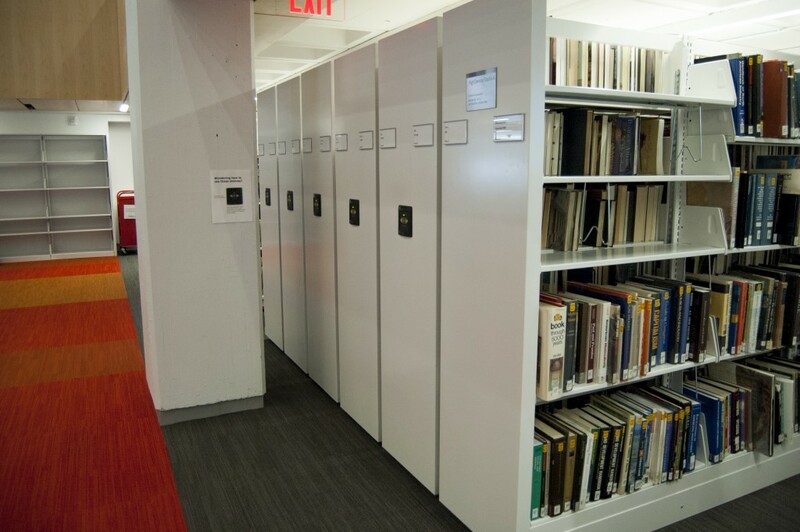 There are two ways to save space within a college library. 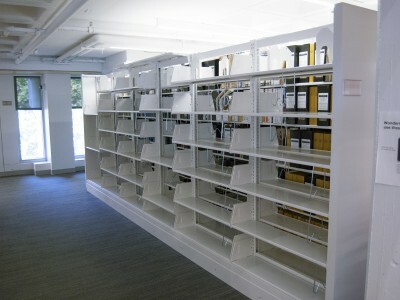 One is to move collections off site, and the other is to implement High Density Mobile Shelving to maximize capacity. 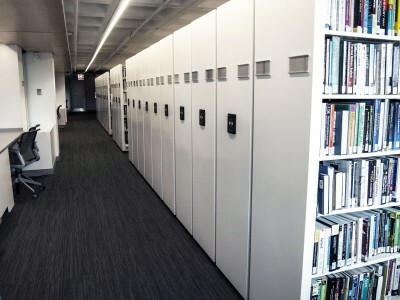 Wentworth Institute of Technology utilized this concept and it not only created more open space for student involvement but it also created more room for collections growth in the future. Many shelves in their High Density system were left open in preparation for new materials. The Douglas D. Schumann Library and Learning Commons renovation won two awards: the IFMA (International Facilities Management Association) Boston Chapter’s “Best Practices: Medium Project” award, and the IIDA (International Interior Design Association) New England Chapter “Best Educational Design” award. New storage, furniture, and a twist to their traditional interior has completely transformed the library at the Wentworth Institute of Technology into a learning commons that students can use well into the future. Learn more about this project in an article written by the Planning for Higher Education Journal.